A memorial has been unveiled in Seaton Park to immortalise the bravery of a First World War pilot. Thanks to a successful campaign by the Friends of Seaton Park, £10,000 in lottery funding was awarded to the park for the memorial. It commemorates Ian Vernon who shot down a Zeppelin near Seaton during the First World War. The unveiling was attended by children from Holy Trinity Primary School, who designed and contributed dozens of tiles that will be displayed with the memorial. Graeme Measor, secretary of the Friends of Seaton Park, said: “It was wet and windy but it was great, we wanted to make it official that the project had been completed. “We applied for and got the lottery funding so we could connect people from all over Seaton Carew with history. On November 27, 1916, Vernon took off from Seaton Carew aerodrome and chased an airship that had just attacked Hartlepool out to sea and shot it down. The bodies of two German pilots washed up on the shore and they were buried with full military honours in Seaton Carew in January 1917. The funding was used to replace the existing pillars in the park with sandstone blocks and add the bronze plaque memorial. It also helped to provide the materials which the schoolchildren used to create their tiles, with designs including handprints and poppies. Graeme added: “The memorial preserves some history from the town and allows the children to create their own bit of history. “The tiles are designed to last for over 100 years and we think it will allow the children to form a visceral connection to the park. 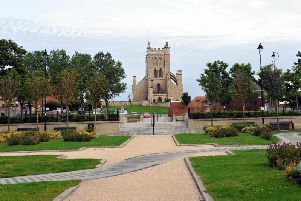 All of the work done on the memorial was completed by Hartlepool based companies and the leftover materials were used in craft activities for the schoolchildren. Graeme also paid tribute to Hartlepool Council Countryside Officer Deborah Jefferson for her contribution to the effort.